When it comes to creating great mobile websites for users, a lot of times things need to be paired down from what might be served on desktop, and one of the top targets for change is the navigation structure. On desktop, many sites have elaborate multi-level navigation menus, but on desktop, the same kind of navigation can result in many disgruntled visitors when they try to use it, since multi-level navigation tends to be extremely difficult to use on mobile. The question came up in a recent Google Webmaster Office Hours about the differences between desktop and mobile sites when it comes to Google rolling out mobile first. John Mueller said that while they expect the content to be the same across mobile and desktop, things like navigation tend to be scaled back for user experience. So for the most part, we do focus on the primary content on the page, which is kind of why people go to this page, which is mostly the textual content, the markup on the page, the visible main section of the page. With regards to navigation and link structure, we do need that as well though, because that’s what gives us context of these pages within the website. We understand how these individual pages are connected, we can crawl through the website through the navigation as well, through the internal linking structure. So that’s definitely important for us too. But essentially those are kind of the two main aspects that we focus on. So the primary content is what we expect to be equivalent, across the mobile and desktop version, and the rest, the navigation, is something that we expect to be kind of usable, it doesn’t have to be the same, usually it’s a very different layout, very different design elements because users interact with a page very differently on a smart phone that compared to a laptop or a desktop computer. Mueller makes it clear they expect primary content to be the same across both mobile and AMP, something that is critical for mobile first. But the primary content, kind of the reason why people go there, is something we expect to be the same. Similarly, if you are making AMP pages for some of these, we do expect the primary content to be the same. Not that you click on the AMP page and it has a teaser paragraph and a button there saying click here to see the actual content, or click here to see the actual video, that’s where we expect to see the primary content to be equivalent across these versions. 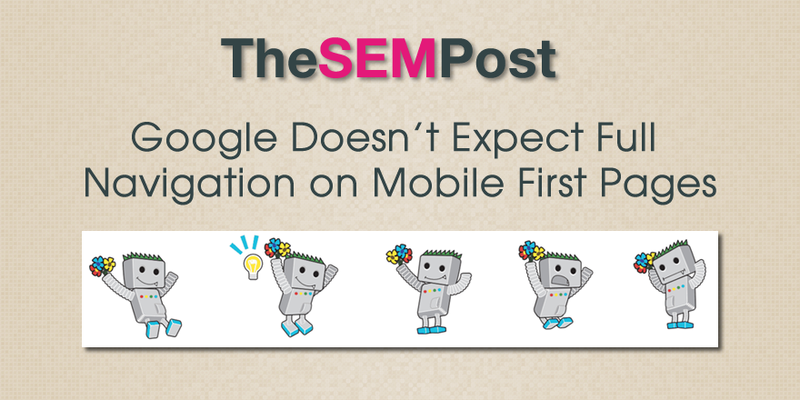 So good news that Google doesn’t expect to see the full navigation on the mobile site, but for mobile first, it still makes sense to ensure your most important pages and categories on mobile first, to help Google understand the important pages on the site. With some desktop navigations being massive in size – some run into the hundreds of links or more – it is easy to see that it would quickly become unwieldy and not very user friendly to try and put that many links on a single mobile page, even if it was in a hamburger menu or another mobile menu style.